While her position as Great Britain’s most successful track and field athlete of the past four years is unchallenged, 2009 has been a singularly challenging season for the Newham girl.At the World Championships in Berlin she lost her 400m title relatively tamely, trailing in a distant fifth behind her arch nemesis, the American Sanya Richards. Not once this season has she broken 50 seconds for the event, a far cry from her world-beating pomp. What will be far harder to accept is if the injury problems return to disrupt her preparations for 2012, where she intends to reward the faith of her home support with a crowning Olympic glory in the stadium that lies just a 10-minute walk from her home. It is not as if she can feign ignorance of the 1,000-day landmark. In the middle of Stratford’s gyratory system there is a clock ticking down to the day the Olympic torch is lit. Adidas, one of Ohuruogu’s sponsors, have given her a T-shirt, emblazoned with an Olympic icon, to mark the countdown. 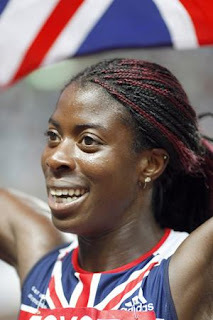 Ohuruogu does not give the impression of regarding the hysteria around her Olympics build-up too seriously. The day that the Games were awarded to London, she sidestepped the celebrations in Trafalgar Square because of a training session. But the Olympics have always been a defining strand in her narrative. Athens 2004 signalled her transition from promising netball player to stellar athlete, when she carved a second off her 400m lifetime best in trials. At least one missing link from her Athens and Beijing performances stands to be rectified in London: her parents, Johnson and Patience, will both be in the stadium. Her rivals have been warned.